Welcome to our Arch-Thief Rafaam boss guide for the League of Explorers adventure. Below you can find more information on this fight including tips to fight against the boss, successful deck lists, and the rewards! Arch-Thief Rafaam is the third boss in the Hall of Explorers wing of the The League of Explorers adventure. Hilariously, if you read into the dialog for this fight in the client.. he appears to steal your deck. Time to build the shittiest deck ever? Rafaam steals your deck! Play something crappy! The deck you get from Elise has a Rare Spear, so give him tons of rare cards! Defeating Arch-Thief Rafaam for the first time will reward you with cards! Once the regular version of the card(s) is unlocked, you can craft the golden versions. We've got boss guides for all the other The League of Explorers bosses! Click on their portraits below to learn more about their fights. I just try it. Works well! Very Easy, got him first try. "I like your deck, i think i will TAKE IT!!!" Any chance you would consider updating the guides? I got into the game at Gadgetzan, and there are some of the cards in many of the decks I am not able to get because of that. Unlicensed Apothecary is fun against this guy. Takes half his HP before he realizes he needs to stop. I don't know why, but my deck held a Youthful Brewmaster. Rafaam steals the deck of course. He plays it on the board AND summons a second one using Unstable Portal on the same turn. The new Brewmaster sends the first one back into the hand. On the next turn, the Brewmaster comes back out and send the other back in. Cycle. Loop. Rafaam drains his mana 4 turns following this loop. Hilarious. I was actually having a hard time until this happened. This was my 3rd try. 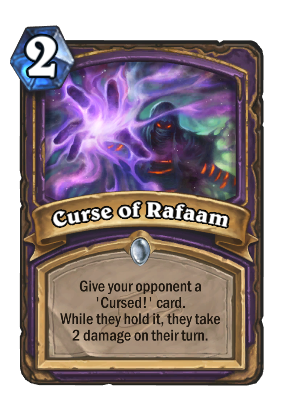 Lesson: Rafaam is not effective at using complex cards like Youthful Brewmaster. I can't beat this guy, just started recently and don't have that many cards, but I really can't create anything with what I do have thay can kill him..
so this guy is pretty easy, and obviously you shouldnt have trouble killing him, but this is the one i came up with, thought it was pretty funny, it probably has a near 100% winrate, because his hero power shuts down around T3 or 4. This is brilliant. I wish i had thought of this. Worked heroic first try without breaking a sweat. Hilarious too!! He fatigued so quickly and never even really had a play. Easiest heroic LOE boss so far with this deck! Shaman might be better because Vitality Totem is pretty useless. This boss is the proof that unstable portal is a BS card and I think Blizzard knows it. You need to balance this deck with rare cards that are not powerful so that when he plays them, your weapon will get buffed while you won't feel too much board pressure. Naga Sea Witch's effect comes before his hero power which means if he summons a 6-drop, normally costs 3 mana, the card will now cost 2 instead of 5. 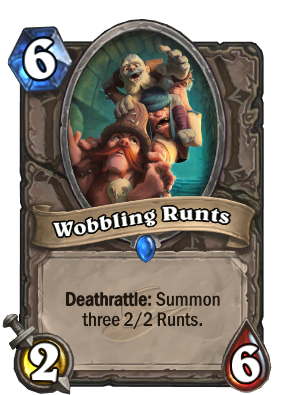 The inclusion of this card is for those low-cost cards in hand, and you'll need a lot of luck to avoid him summoning 6-mana or higher to get extra value from it. 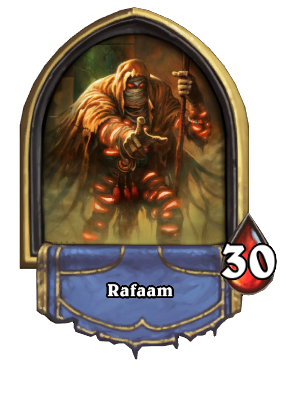 Rafaam will not play Sir Finley Mrrgglton and will save it as the only card in his hand. That's when you use Mind Vision to get it when in mid or late game, discover another hero power and react to his play.